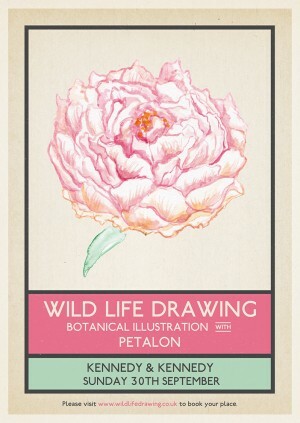 Incredibly excited to announce a special Botanical Illustration class with Florence Kennedy of Petalon. Florence built up her successful flower-delivery-by-bicycle business from scratch and now her floral designs adorn shop fronts, special events and she takes on limited amount of weddings per year. Her style is influenced by seasonality and she creates loose, exciting bouquets and centrepieces with unique and unexpected flowers. For this focussed three hour class, Florence will be creating a variety of arrangements with summer blooms for you to sketch and there will be a wide range of materials with which to experiment – with artist Jennie Webber demonstrating techniques including watercolours, watercolour pencils and brush pens. Our aim is for everyone to go home with a deeper understanding of plants, a greater confidence in using different materials and artworks they can be proud of! All drawing materials are supplied, including paper and drawing boards, but please feel free to bring colours or any other specific media you might like to use. We'll start with some fun drawing exercises and plenty of practical tips to get everyone started, and creative guidance will be on hand all the way through the session. The aim of these drawing classes is to inspire a sense of appreciation and understanding for the the natural world.